Two members of a militia group known as the White Rabbits have admitted bombing a mosque in Minnesota in 2017. Police say Michael McWhorter, 29, and Joe Morris, 23, wanted to scare Muslims into leaving the US. The pair, who admitted a number of charges, including a failed attack on an abortion clinic, face up to 35 years in prison following a plea arrangement. 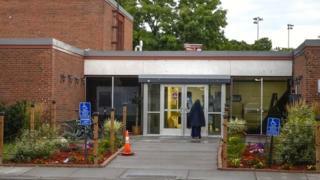 No-one was hurt in the attack on the Dar Al Farooq Islamic Center in a Minneapolis suburb. A third man, 47-year-old Michael Hari, who is the alleged founder of the White Rabbits, is in custody and awaiting trial. He was not party to the plea arrangement. Police say McWhorter confessed that the White Rabbits had wanted to “scare [Muslims] out of the country”, with the message “you’re not welcome here”. According to the plea agreements, the men drove to the mosque, broke a window and threw a lit pipe bomb and gasoline mixture inside. It is unclear why the pair, from Illinois, attacked the mosque in Minnesota. The governor of Minnesota at the time, Mark Dayton, called the attack “a criminal act of terrorism”. Dar Al Farooq Islamic Center largely serves people from the Somali community. In a separate case, three men who plotted to attack a mosque and apartments housing Somalis in Kansas in 2016 are scheduled to be sentenced on Friday. Previous Who is Trump ally Roger Stone?